50% Off Entire Stock - now ONLY $10.99! 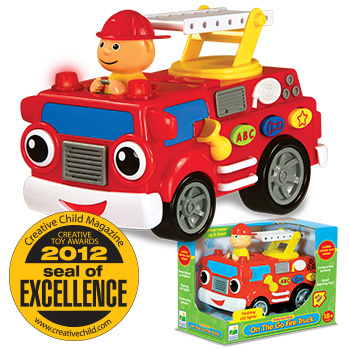 Your child will be off to the rescue with the On the Go Fire Truck. This interactive, free-wheel Fire Truck has a working ladder that moves up and down and rotates 360 degrees. It also has interactive buttons that play sounds and melodies. As your child pushes the fire truck along, it plays melodies, has eyes that move from side to side and a driver that moves up and down.